Villas are not just for multi-generational family get-aways. Young adults and couples without children can enjoy a luxurious get-away in a private villa too. Renting accommodation gives you a great way to explore cost effectively and gives you plenty of luxury and privacy. St. Martin/Maarten is the perfect place to visit, with no shortage of exciting experiences to participate in. Traveling with teenagers can often pose some unique challenges. 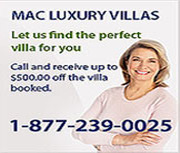 Private villas can often address a few teen requests all-in-one. Villas provide your teens with their own bedrooms, giving them that personal space they enjoy. Villas also combat the "there's nothing to do" whining, when a villa is selected which has a pool, tennis court, and gym (see villas below). St. Martin/Maarten is also an island with many fun excursions, for all ages. Spend some time rejuvenating your relationship, or share some vacation time with another couple. Either way, we have a villa for just that. It's your time now. Time to do something for just the two of you. Enjoy tranquility, exclusivity, and the elegant life of St. Bart's. Or take a load off in Anguilla.